This little boy just restored our faith in humanity. 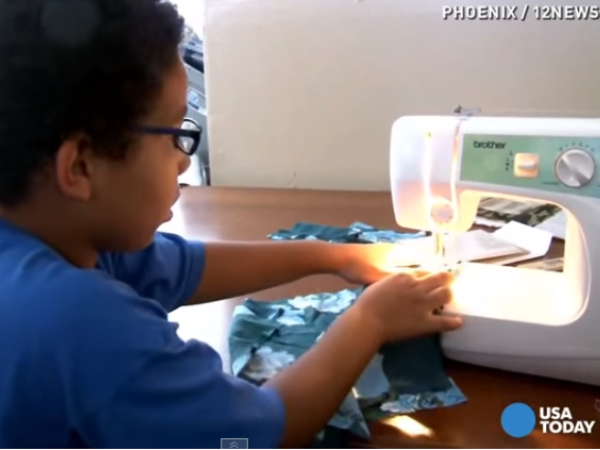 Xavier Elliot, from Phoenix, Arizona, prefers to spend his free time at his mom’s sewing machine making clothes for the homeless. The boy’s inspiring dedication to help those in need comes from his family’s own experience. When his father returned home after serving in Iraq, he was diagnosed with post-traumatic stress disorder which led the family to spend time in six different homeless shelters. “I think the idea came to him from everything we have endured and wanting to make a difference for other people,” said Stephanie, Xavier’s mother. Even though the family now has a permanent home, Xavier hasn’t forgotten the experience. He uses his pocket money to buy fabric, buttons and zips before making the clothes himself. According to HuffPost, Xavier took up sewing after watching his mother at work. He hopes to raise enough money to buy his own sewing machine. “I hope it [encourages] other people to help me," he told KPNX. "So I could help other people."